If you're tuning in to the Super Bowl this Sunday, chances are you already know the drill. Start with some football, sprinkle in some overworked commercials and stats on how many potato chips are being consumed during the game, have your uncle tell you why Tom Brady isn't the greatest of all time - and that's pretty much it. But while it's easy to get distracted by the circus of the big game and the week which precedes it, this is still football played in the same way as any other Sunday. And that means you can also expect to see another thing: a player receiving a concussion. In that event, NBC's Al Michaels and Cris Collinsworth in the booth will throw things down to sideline reporter Michele Tafoya and we'll get walked through how the player is in the league's concussion protocol. Later, there'll be word on if the player has been cleared to return. You've seen this movie before, right? All seems above board? Well, after spending time edging closer to the consciousness of the average football fan — whether through the death of Junior Seau in 2012, the $1bn settlement struck with former players or last year's damning CTE study — the NFL's current procedure regarding head trauma has been put under the microscope and found lacking. The issue, in a way, is akin to an iceberg. We may see the tip, the impact on the field, but under the water exists pre-injury prevention methods, neurological assessments, post-injury therapy and glaring frailties within detection. Add those to the agendas of individual players, the NFLPA and the NFL itself, and you're left with something which, if not dealt with, could hurt football far more than the mind-melting catch rule. 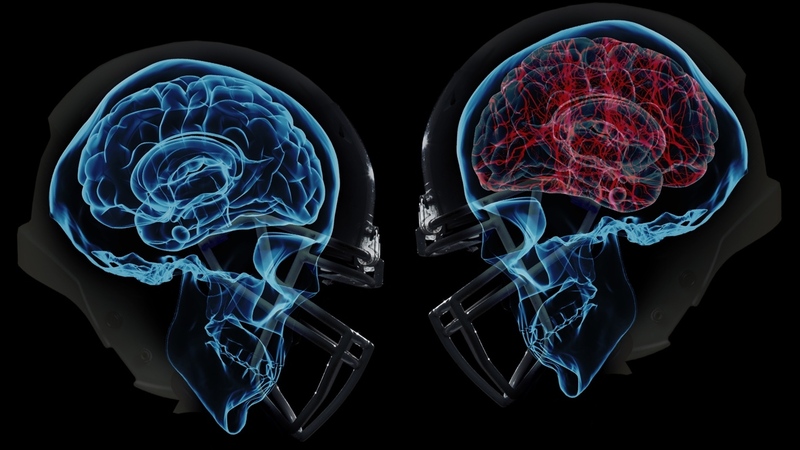 It's a reality the league is coming to terms with, and why wearable technology is set to lead the charge in a reformed look at concussions and other neurological trauma in the coming years. Since 2015, the NFL has taken Super Bowl week as an opportunity to work with startups and burgeoning technologies with a program called 1st and Future. And many of these proposed technologies attempt to deal with the concussion problem, whether that's within the white lines or away from them. But just how far do we sit from a Super Bowl in which players are less susceptible to the dangers of brain trauma? "We've developed a complete system that allows you to monitor athletes in real time in the field of play and collect data on the head impact they receive," says Steve Washburn, the CEO of Prevent Biometrics, a startup whose smart mouthguard will be tested by the NFL over the coming months, ahead of potential implementation further down the line. His company, a spin-off that has leaned on research from the Cleveland Clinic, has spent years developing technology that can detect severe head trauma in real time. "The research community has come to agreement in how to test accuracy in these devices, and I'd say that nothing is close to as accurate or as far developed as what we have today," he says. "And the secret sauce here is the algorithm we've created. It works through four accelerometers on the mouth guard that triangulate to a point in space, the centre of gravity of the head. And you're monitoring things continuously in real time between the location around the arch of the front teeth to the centre of the head. "That point in space is what we're measuring: it involves linear acceleration, angular acceleration, and, because it has six degrees of freedom, we're able to accurately detect location and direction of the impact, as well as the number of impacts. And that number metric is crucial, because it's believed to contribute to the cousin of concussions, CTE." So, why mouthguards, and not patches, headbands or other wearables? As Washburn describes it, non-introversive devices suffer too much movement in order to be accurate, and the only way to track head impact with a high level of consistency is to have something mounted to the teeth. That way, the algorithm is able to differentiate between a significant trauma and a player making calls on the field, running around and receiving a normal impact. With Prevent's solution, each hit that's collected creates a specific wave, kind of like a graph, that measures magnitude and time. Head impacts, the company says, have a specific pattern, while non-head impacts are distinguishable from this. And with the NFL this week acknowledging that concussion figures were up on 2016's numbers, the pressure is on to find something that can objectively detect a significant head impact. A total of 281 concussions were reported in this year's preseason and regular season, compared to 243 in 2016 and the five-year average of 243, which is a 15.6% increase. 179 concussions occurred in regular season games, too, which is an 8% increase from 2016. Of course, with the current process dealing with a myriad of subjective factors, there's naturally questions as to whether concussion numbers are indeed increasing, or if more players are self-reporting, teams are firmer in their handling and rule changes (many of which relate to protocol and re-entry) have contributed to the spike. Dr. Allen Sills, the NFL's chief medical officer, said earlier this week, "Certainly, we're disappointed that the concussion numbers are up. And I believe we will attack that problem in a number of ways. We will attack it by sharing with individual clubs the data about the incidents, particularly with regard into preseason and the timing of those concussions. "We will continue to collaborate with, communicate with, and inform the Competition Committee around the rules of the game and discussions about that. We'll also continue our work on protective equipment. So, we take this as a challenge, because we're not going to be satisfied until we drive that number much lower, and that's going to continue to be a focus of our efforts." But according to the Centers of Disease Control and Prevention, half of all concussions go undetected. So despite the figures being pored over by all stations of the league office, there's strong evidence to suggest that the current numbers are inaccurate and only scratch the surface. That's a problem Prevent might be able to solve. Once the mouthguard detects a significant impact, the sideline is alerted and the player is then pulled for evaluation. The technology is complex, but its aim of providing on-field objectivity is simple. And while that solves part of the problem, as Prevent's David Sigel tells us, that's really just the initial stage of the wider issue. "There are other pieces to the concussion puzzle — it's complicated," he tells us. "Our mouthguard doesn't diagnose concussions, it's not a medical device and we're not trying to take the place of a physician or anything like that. The main problem we're trying to solve is in-game concussion detection. It's a subjective process, so we want to put data and certainty into whether somebody should be pulled off the field and assessed. "I wouldn't say this is the one and only thing that's going to solve the concussion crisis, but it does provide a level of fundamental information that's not available anywhere else and would be tremendously helpful to trainers trying to do their jobs." Even if a player is pulled from the field with 100% accuracy, the league's current concussion protocol requires an independent neurologist to conduct an assessment on the player and establish whether they have a concussion and are allowed to re-enter a game. While the likes of Prevent can bring in-game objectivity to the mix, looking to remove doubt from the concussion evaluation on the sidelines is SyncThink, a company which has developed an FDA-approved eye-tracking platform, Eye-Sync. "Absolutely," says SyncThink's chief technology officer Dan Beeler, when asked if Eye-Sync can help eliminate the grey area within current concussion assessments. "The state of current diagnosis of concussions is largely subjective, and the tools that have traditionally been available — such as memory assessments, reaction time — are not particularly accurate, and it requires the co-operation of the individual. But the largest component of that process is the subjective assessment of the clinician, and nobody involved in this process is comfortable with this situation." The eye-tracking technology used by SyncThink has, in fact, been in the works for over a decade. But during the rise of VR around 2014, the company saw an opportunity to incorporate its work into a mobile platform. In doing so, it's now progressed onto the sidelines of some of the biggest college football programs in the country, including Stanford, USC, UCLA and Texas. When a player is evaluated, the typical assessment takes just one minute, Beeler says. "On the sidelines of every football game, it's the first thing that's used to evaluate an injury, because it provides fast, subjective information, and if there's any impairment then teams can immediately remove the player. "There's a number of injuries that can be involved with an impact to the head. There's ocular motor impairment, which is measured directly through eye tracking. There's ocular motor vestibular impairment, which is your balance system. There's cognitive injuries, and also symptoms which would show up on a spine or neck injury. By isolating these different types of injuries, you can more effectively treat them." But is such a technology set to make the leap from the college ranks to the pros? Right now, let's just say it's complicated. While Beeler states that working with the NFL is in the pipeline, channels are open and teams are interested in the technology, there are also more factors to consider. "The league needs to be absolutely certain that it's going to fit in their program, and you also have more stakeholders involved. The NFL, for instance, has the athletic trainers, it has the NFLPA, team physicians, and of course its own interests. And they all need to be on the same page," he says. Even if a partnership with the NFL takes some time to develop, SyncThink is also keen on implementing other wearable sensors in order to provide a fuller picture. Not just in-game solutions like Prevent, either, but also post-injury technologies that track sleep and monitor recovery over a longer period of time. When will we see this technology in the NFL? There are many more companies on the NFL's radar aiming to help in the same areas as Prevent and SyncThink, but, in the end, only the most accurate, most streamlined pieces of wearable technology will rise to the top. And while it can't come soon enough, it also has to be technology that fits. Recently, technological advancements have propelled the reality of wearables keeping players safe behind the scenes on an NFL Sunday. "I'd say it's a couple of years away," Prevent's CEO tells us. "Everyone recognises the problem and is excited about the technology. There are issues around behaviour change, compliance and rule changes, so just to get everyone educated, I could easily see that taking a couple of years, but everyone's aligned to finding a solution." There are also more practical elements which need addressing, such as data being used against players in contract negotiations (something we've also seen in the NBA) and making any winning solution affordable to all levels of football. The NFL Commissioner, Roger Goodell, after all, is on the board of USA Football, the governing body for amateur football. "The engineering work we are doing will hopefully stimulate change, and we'll reward those who provide really interesting ideas. The opportunity for new protective equipment and advances and innovations to the way protective helmets and equipment are worn on the field is really here now," says Jeff Miller, the NFL's executive vice president of health and safety initiatives. And it's hard to argue with the assessment that an acceleration towards a safer game is underway. After initially striking into the concussion iceberg and struggling to find the technology to help keep players safe, the NFL has never been more armed against neurological issues than it is right now. With more testing, more partnerships and more backing over the coming months and years, the murky waters surrounding the concussion crisis will no doubt become much clearer.